Since Berlin is lacking a real skyline, the Berlin TV Tower (or Berlin Television Tower / German: Fernsehturm) is basically the skyline of Berlin. Designed and built in the sixties the TV Tower is not only Berlin’s highest building, but also the highest building of all Germany and highest publicly accessible building in Europe. The tower restaurant is at a height of ‘only’ 207,53 meters – but the top of the tower reaches 368 meters high. 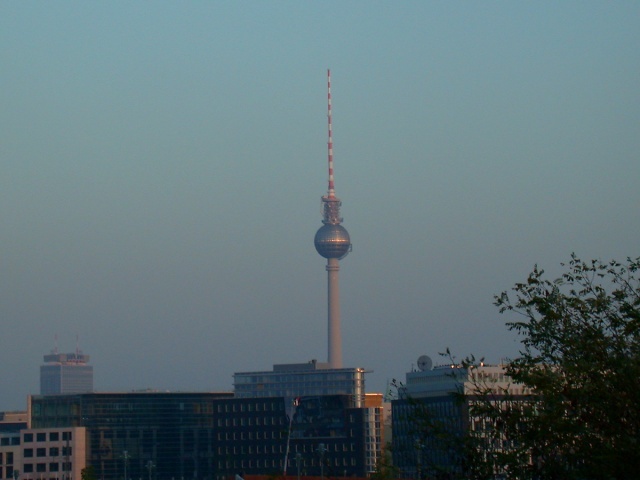 The TV Tower is also one of Berlin’s most popular tourist attractions. There are approximately 1.2 Million visitors each year. At a maximum capacity of currently 320 visitors you may have wait for a while to actually take the ride up to the Top of the City – especially on weekends and public holidays. But both waiting in line or booking in advance is well worth the effort: the 360° panoramic view from the restaurant and the observation deck is simply overwhelming, even if the weather conditions are not optimal. So if you happen to have the time and patience, take a trip up to the tower restaurant and/or the observation platform and enjoy the view. With good weather conditions you might see as far as up to 50km – sometimes even up to 70km. So theoretically you could see parts of Potsdam or even the river Oder which is right at the border to Poland. Theoretically. But also ‘just’ looking at the streets and houses around Alexanderplatz / around Mitte is already a thrill. And of course the view from the TV Tower is also a nice photo opportunity. The tower restaurant is actually built on a rotating floor. So you may enjoy your meal or your coffee and cake – or even a cocktail while ‘spinning’ around above the city. While the moving of the restaurant is definitely noticeable, it’s rather slow and won’t make you spill your drink. But the speed actually used to be even slower: back in the days, when East Berlin was still the capital of East Germany, the restaurant made a full 360° round every hour. After that hour you were supposed to leave. Now the speed can be switched between one or two rounds per hour – and you’re basically free to stay ‘as long as you want‘ – although I suppose the staff has polite ways to let you know when it’s time to leave. I personally only paid two visits to the restaurant, if i remember correctly. And on both occasions we only had a few drinks during sunset hours. Watching the sun go down with a drink and a dear person can be such a nice thing to do in general – enjoying the view from the TV Tower Restaurant while the sun sets adds definitely to the experience. But of course also having a breakfast or lunch at the TV Tower is probably quite a nice experience. Breakfast and lunch is served daily from 10am until 4pm – dinner from 4pm until 10.30pm. The special 360° BERLIN brunch will cost you a bit more than 15 Euro and a dinner plate is available at prices between 15 and 40 Euro. A glass of wine will cost you around 4 – 6 Euro, for a Gin Tonic or an Aperol Spritz you would have to pay 7.50 Euro. The amazing view is for free – and so is the WiFi Hotspot. Some additional trivia about the tower restaurant: the TV Tower Restaurant doesn’t have a kitchen – at least not at the restaurant level. The kitchen is instead located downstairs. But there is no need to wait any extra time because of this – all ordered dishes are brought up via a special super fast elevator. Talking about speed and elevators: the freshly renovated elevator (the one you use to get up) is not Berlin’s fastest elevator, but it still is really fast. It moves at a speed of 6 meters per second – that’s roughly a bit more than 20km/h – or slightly more than 13 miles per hour. In about 35 to 40 seconds the elevator will bring you from ground floor to the observation deck. Looking up during the ride you may enjoy a special kind of tunnel vision: – the top of the elevators made of glass. The official name of the Berlin TV Tower is “Fernmeldeturm 32” which implies that besides being a touristic attraction, it also has a very practical use. 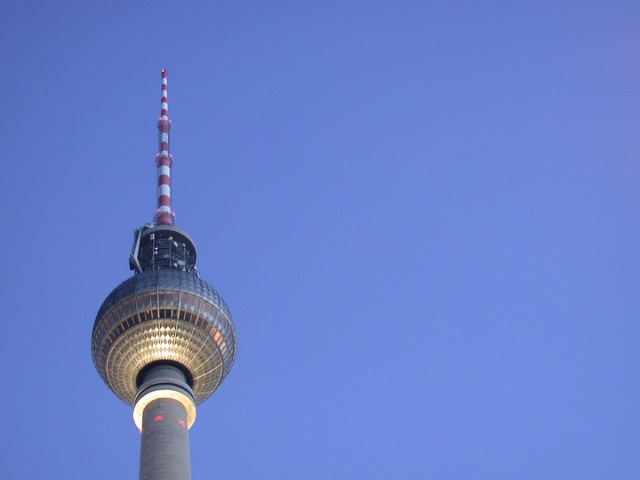 Most of the an air Radio and TV Signals you can receive in Berlin and surrounding Brandenburg are actually broadcasted from the Berlin TV Tower. And broadcasting was of course the original reason why the tower was built in the first place. Since Berlin was divided and the Berlin Wall was build in 1961, the German Democratic Republic (GDR) practically had no access to the Radio Tower (Funkturm) that was now located in West Berlin. So the East German government decided they had to build their own radio tower – which became the TV Tower. So the Berlin TV Tower is basically yet another example of the Doubling that came along with the division of Germany. The TV Tower is open to the public on a daily basis. There are however different opening hours during summer and winter months. From March through October you can visit the TV Tower daily from 9 a.m. to midnight. From November through February the tower is open daily from 10 a.m. to midnight. Tickets can be purchased either on location at the box office, or online through the website of the Berlin TV-Tower at tv-turm.de/en/tickets-preise.php. The price for a regular day ticket is 13 Euros. If you don’t want to wait in the line you may want to pre-order a fast track ticket online. The fast track ticket is called “Fast View Ticket” and it is of course slightly more expensive than a regular ticket, but with a price tag of 17,50 Euro still quite affordable. If that is a bit too expensive for your taste, but you still don’t want to wait in the queue, you may want to purchase a “Early Bird Ticket” or a “Late Night Ticket” for 15,50 Euro. On the website there are also different tickets and also reduced ticket prices for children (starting from 8,50 Euro) and groups available. And you can also make a reservation for a table at the tower restaurant. Since the TV Tower is located directly at Alexanderplatz, there are quite many public transport options that will bring you more or less directly to the foot of the TV Tower. Depending on where you begin your travel, the easiest way to get to the TV Tower would probably be either by S-Bahn or U-Bahn or Train (Regio Express) and jump off at station Alexanderplatz. You can of course also take the Bus 100 or the Tram and/or jump off at Hackescher Markt and walk your way to Alexanderplatz. I would personally prefer to walk, since walking towards the Berlin TV Tower can be a nice thing to do because of the sheer greatness of the tower, literally. You have the TV Tower in front of you and with every step you make it just seems to get a little big taller, until you reach the very foot of the tower and the 5.000 ton disco ball is right above your head.